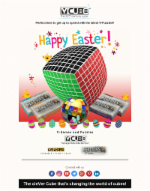 "No Limits", is V-Cube's e-Newsletter where you'll find the latest product and company news, inside information for speedcubers, happenings, the newest series of V-Collections theme cubes and everything that has to do with the cleVer Cube and YOU. 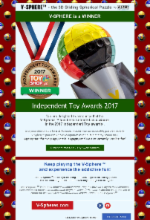 V-Sphere™ has been selected as a winner in the 2017 Independent Toy awards. We are delighted to announce that the V-Sphere™ has been selected as a winner ﻿in the 2017 Independent Toy awards. Perfect time to get up to speed with the latest V-Puzzles!! THE STAKES ARE RAISED BY A LAYER! 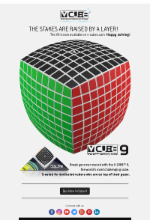 The V-Cube 9 is available Happy Solving! The Labors of Hercules is a series of four puzzle collections each containing a trilogy of fascinating pattern puzzles with incremental solving difficulty. Are you ready to face the ultimate challenge? 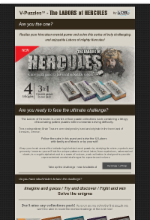 Realize your Herculean mental power and solve this series of truly challenging and enjoyable Labors of mighty Hercules!